Yes, it’s still cold and damp outside and as if that’s not bad enough everyone seems to be going down with coughs and sneezes. 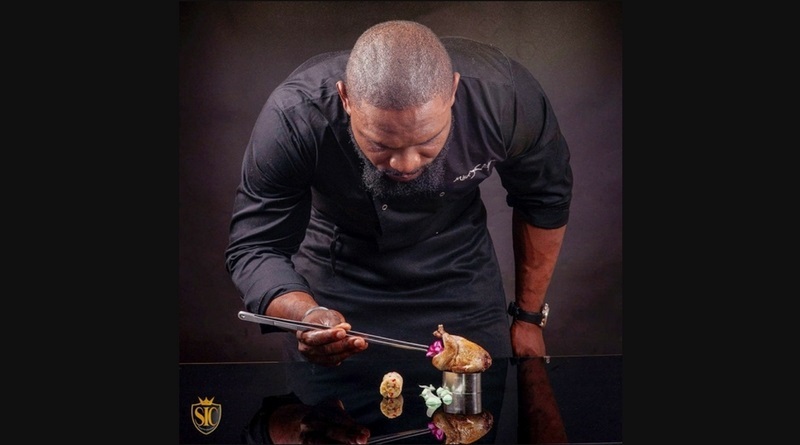 So we’ve asked International TV chef Mick Élysée to brighten our tastebuds and boost our health with some of his delicious afro-fusion recipes. Each one is packed full of tasty ingredients that deliver a real vitamin and mineral kick guaranteed to lift your mood and health. Mick’s new cookbook Not Guilty, brings his gourmet take on African cuisine to the UK. Mick’s background makes the combination of flavours and ingredients in his recipes so unique. Born and raised in the Congo, Mick’s life was turned upside down when several of his immediate family were killed in the Congolese civil war in 1993. At the age of just 14, he arrived in France as a refugee, but it was his love of food that saved him, getting accepted into one of France’s most prestigious culinary schools before eventually opening his own restaurant aged just 22. Not Guilty is a collection of gourmet Afro-fusion recipes, perfect for adventurous and health-conscious foodies everywhere. While the aubergine (or eggplant) is often associated with Asian food, not many people know that this fruit (it isn’t actually a vegetable) is also a popular ingredient in Central African cuisine. Eating aubergine as a part of a balanced and healthy diet can also help fight fatigue, stress, mood swings and insomnia thanks to the high levels of minerals, anti-oxidants and vitamins. It contains vitamin B6 (which helps the body absorb minerals), vitamin B1, B2 and B5, vitamin K and vitamin C. Eggplant also helps reduce levels of bad cholesterol in the body, and research has shown that it could even help to reduce the risk of some types of cancer. To make the marinade for the mackerel, peel and cut the ginger, and shallots into thin slices. Julienne the carrot. Chop the herbs and combine all ingredients in a bowl with the oil and lime juice. Season to taste with salt and pepper. Place the mackerel fillets in a gratin dish and cover with the marinade. Mix lightly ensuring each fillet is covered and set aside in the fridge for about 45 minutes. Meanwhile, place the eggplant in a saucepan with cold water and bring to a boil. Remove from the heat, cool and drain. Remove the skin from each eggplant and slice them in quarters. Place each quartered eggplant on a plate in a circle. Top with the mackerel fillet, then the sliced and julienned vegetables and finally drizzle with the marinade. In this recipe I suggest quinoa, but if you’re feeling a bit more adventurous then you can change the South American crop out for an African cereal: Fonio. Fonio contains a high level of minerals (magnesium, zinc) and twice as many amino acids as quinoa. It’s rich in fibre, so great for digestion and helps balance blood sugar. Its also gluten free which makes it a great choice for coeliacs and others wishing to cut gluten from their diets. Fonio is simple to cook too, just like rice. For each cup of fonio add three cups of water, bring to the boil and simmer for seven minutes. The grains will absorb the water as it cooks. Remove from the heat and leave it to rest for a further three minutes so that the grains fluff up. Combine the marinade spices in a bowl and sprinkle over the chicken legs. Set aside to marinate for 10 minutes and then bake for 20-25 minutes. Remove from the oven and set aside at room temperature. Chop 1 onion and saute in a saucepan with the olive oil over a low heat for about 2 minutes. Add the remaining spices and cook for a further 5 minutes. Chop the second onion, chilli, tomatoes and peppers and combine in a blender with a little water to obtain a creamy puree. Pour into the saucepan and cook for about 8 minutes over high heat. Add the quinoa and chicken stock to the saucepan and bring to a boil. Cover and cook over a low het for about 20 minutes or until the liquid is absorbed. Then remove from heat. Serve warm with a dash of chilli oil or chicken cooking juice. Bissap makes this dish a glorious shade of red. It is great for lifting the spirits and used by many across Africa to restore happiness and manage mood swings. Bissap helps ensure good kidney function, can combat liver problems, lowers blood pressure, soothes colds and has anti-bacterial properties. In the UK it’s mostly known as hibiscus, and sold as a tea. Mix the bissap and remaining ingredients, except the pears, in a saucepan of cold water and bring to a boil for about 15 minutes. Peel the pear, holding on to the stems, and plunge them into your pan of bissap juice. Cook for 5 to 7 minutes (depending on size). Remove the pears and set aside. Pass the bissap through a fine sieve. Collect the juice and pour in a soup bowl then finish with the pear. To be served hot, with crushed pistachios or coconut flakes.